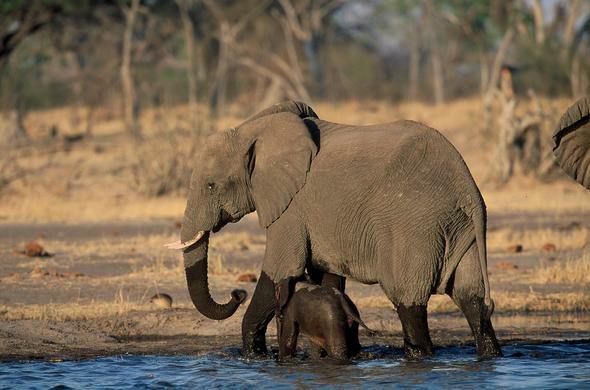 One thing is assured on your Chobe National Park safari, you will see Elephants. In the parched winter months, the region is home to around 150,000 Elephants and large herds pass through. Elephants are the largest land mammals in the world, they are recognized by their long trunks, large ears and their unique tusks. Each of these parts of the Elephant is a functional body part. Their trunk serves to help them get food into their mouths, for drinking water or spraying water over itself. They use their ears as ventilation to help them keep cool, as blood vessels found behind their ears are used as a cooling system for the Elephants. As the skin is thin here the heat can dissipate more easily. Due to the Elephants thick skin it is difficult for them to regulate their body temperature. An Elephants tusks (a signature part of their body) grow throughout their lives, sometimes being damaged or broken. The male Elephants carry larger tusks than a female. An Elephants habitat is heavily determined by the amount of shade in any given area, as well as the availability of food and water. 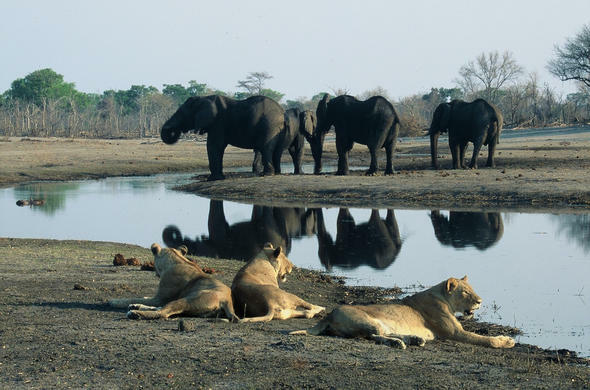 Large concentrations of Elephants can be found in the Caprivi and the Northern parts of Botswana, especially in Chobe National Park. 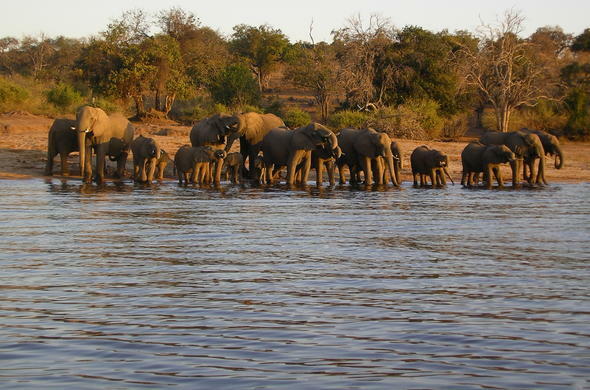 Chobe is known to have the largest population of Elephants in the world. They can also be found in Tuli Block, Northern parts of Makgadikgadi, Western Okavango and Mmadinare. A group of Elephants is lead by a older female known as the Matriarch and the herd consists of her offspring as well as other related Elephants. Families may join with other families to form herds, sometimes building up to herds in their hundreds. Once male Elephants reach their early teens (around 12 to 13 years of age) they will be forced out of the herds. They will then join small groups of much older males after wondering around on their own for a while. Elephants are active during the day and the night, although periods of rest are taken in shady areas. Elephants can be very dangerous when wounded, ill or protecting their young, but most of the time they are quite passive by nature. A female Elephants pregnancy lasts for 22 months, and the average weight for a calf at birth is 120kgs. Newborn Elephants are much hairier than adult elephants. Females are extremely protective of their young and will assume responsibility of another's young by way of nursing and protecting the calf if anything should have to happen to the mother.Male Elephants go into a breeding condition (Must) once or twice a year. This condition causes a male to become very aggressive due to high testosterone levels. The male will then go in search of a female that is in heat and ready to mate. The female will then decide whether the male is worthy and then allow him to mate with her.